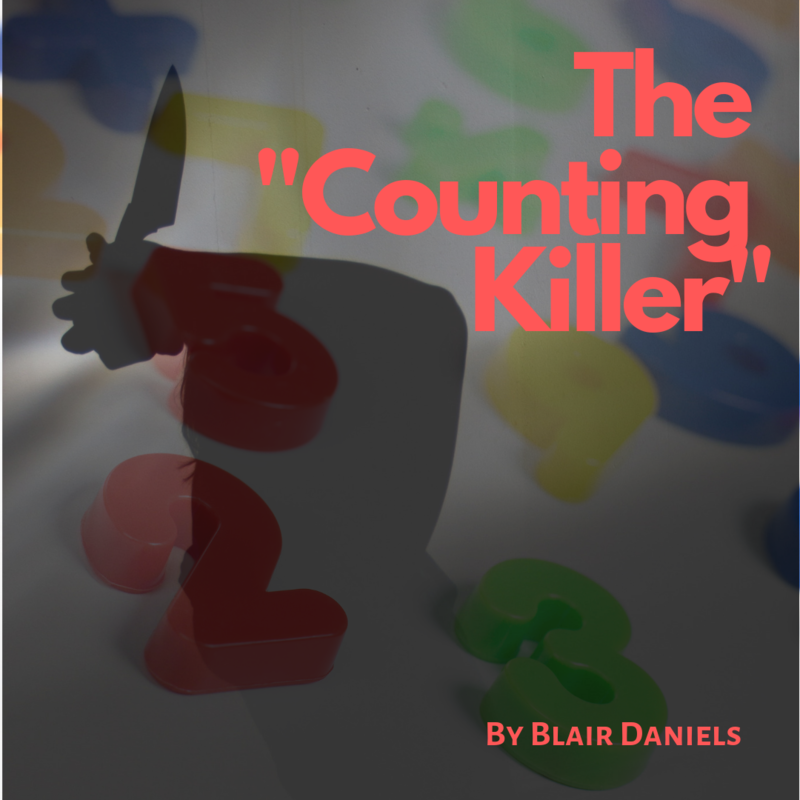 “The Counting Killer is on the loose,” the TV blared. I dropped my fork. Tomato sauce splattered on my shirt, then on the floor. I leapt to the windows. Plip-plip-plip – rain pattered outside, running down the glass in thick lines. Click. I ran to the door, my footsteps shaking the little house. Clink. The chain slid against the metal. I turned back to the TV, my heart pounding. The police chief stepped down from the podium. A flurry of movement – microphones, cameras, pushing towards the stage like the tide coming in. “Do you think he’s going to kill someone tonight?” a man asked. “I cannot confirm or deny that,” Chief said, the wrinkle in his brow deepening. He’s covering up, I thought, turning the volume up. Of course he can confirm that. Theresa Rivers, victim number 3, was stalked inside her house for hours. The forensic team even proved it! “And he writes what number kill each victim is, in their own blood, on their forehead – isn’t that correct?” a man yelled. “Yes, that is correct,” he said, his face starting to shine with sweat. I flicked off the TV, my heart fluttering wildly in my chest. Lightning flashed outside, throwing the backyard into relief. The swaying trees and wooden fence were white against the black sky. Shadows danced across the trees, the grass, the patio. And, if one had too much imagination, they appeared to take form. I tugged at the blinds, pulling them over the glass door. But some of them were missing. Silence, save for the pit-pak-pit of the swelling rain. Just my luck, I thought. The power’s out. Never should’ve chosen a house so far from the main road. I stumbled towards the kitchen, banging into just about every piece of furniture along the way. I pulled at the drawers madly. There’s got to be matches in here, I thought, as forks and knives clacked against each other. The thud of footsteps, barely, over the rain. Or was it just my imagination? Hands shaking, I grabbed the knife on the counter. A shadow. It disappeared behind the blinds, then reappeared in the gaps – still frames of motion, like the pages of a flip book. The sound a locked door makes, as someone tries to pry it open. Heart pounding, I ducked into the pantry. The air was thick and stale, steeped in expired bread and flour. I groped around for matches, a weapon, anything that might change my odds – but my hands only fell on cans of food. I locked the front door, the back door, the windows. I leaned against the shelves; they dug into my back. But even when everything is locked, there’s always a way in. I gripped the knife harder. Footsteps, squelching on the hardwood floor, moving through the living room. Maybe I can escape without him seeing, I thought. If he thinks the house is empty… My hand tightened around the doorknob. But the door didn’t open. Thud, thump. The footsteps retreated now. Taking a deep breath, I turned the doorknob. Cold, wet fingers clawed into my shoulder. “Don’t move!” he yelled. But I thrashed and wriggled, still gripping the knife. It slashed wildly at the man’s arm. He crumpled to the floor, yelling in pain… between me and the door. The man reached for his hip. A gun, gleaming in the dim light. I leapt up the stairs. Shouts rang out behind me. My legs burned, grew stiff; but I kept going. A hole smoldered in the wall, a foot from my head. I ran and ran, until I was in the master bedroom. “Ow!” I hissed. My toe collided with something long and soft, lying across the floor. Limping, I ran to the window – but nearly slipped, as the floor was wet beneath me. I ran into the closet. I swallowed the urge to cough. The fake, flowery smell from blouses and perfume was overpowering. Don’t make a sound. Make a sound and you’re dead. “Do what I say, and I won’t have to hurt you,” the voice called, hovering on the landing. Stomp. “Just come back down here and it’ll all be over with.” Thump. I gripped the knife harder. My shuddering breaths seemed deafening in the tiny closet. I peered through the crack. The man’s shadow fell across the doorway, thin and stretched, almost subhuman. The silhouette paused, mumbled something into his shoulder, and continued towards the closet. In one smooth, powerful motion, the knife stabbed into his chest. I collapsed, several feet away from the body. I did it, I thought. I’m alive! I threw my head back and began to laugh. I thought for sure I was dead meat! I laughed and laughed until my sides were sore. Then I stuck my finger in the blood, and traced it across the man’s forehead. Rumbling footsteps shook the house below. Shouts, murmurs, stomps. White rays of flashlight swept across the house. I pushed the window open. With a deep breath, I slipped out of my victims’ house and climbed down their flower trellis. I landed in the soft, wet ground below. Then I took off running into the forest.